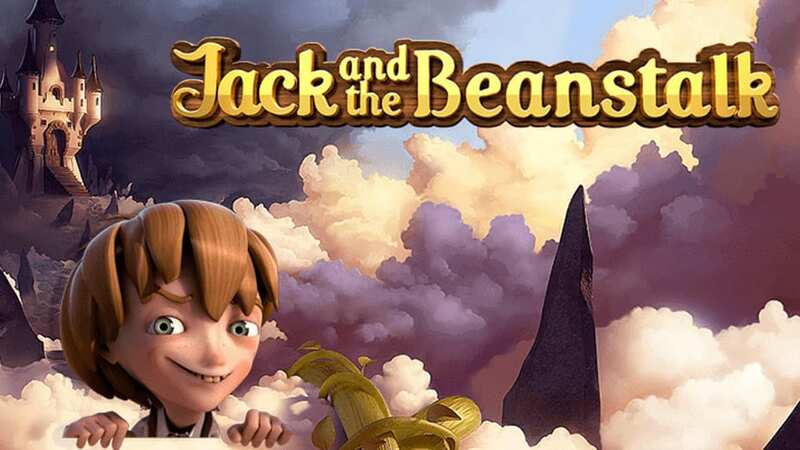 Climb the beanstalk with Jack on his journey for riches and defeat the troublesome giant in this encapsulating 5 reel casino, video-enhanced slot experience. Look-out for the Walking Wilds that move to the left after every free spin. Get started and play slots online at this link! Jack and the Beanstalk is a story as old as time. The story of the poor peasant boy who is helping his mother on the farm along with their magic cow and his magic beans. What continues is Jack’s ascent up the perilous beanstalk all the way to the Giant’s castle at the summit. You would think his mother would have noticed that he was missing or at least that a giant beanstalk was in the garden. Nevertheless, we are overanalysing the fairy-tale a bit much and there’s probably some important lessons to be learned about planting magic beans. So this game is for all you fairy tale lovers out there. We all know the story, and now those nice people at Net Entertainment have turned it into a slot game you can play and win money on! How nice of them! It isn't rocketing science to understand what the aim of the game is – you need to help young Jack climb the beanstalk and by doing so you’ll have lots of fun and potentially put a penny or two in your pocket! Go and a journey to discover our slot games here. As mentioned, the game has been developed by industry veterans NetEnt. These guys certainly know what they’re doing and have produced many a good slot over the years. This one doesn’t disappoint. 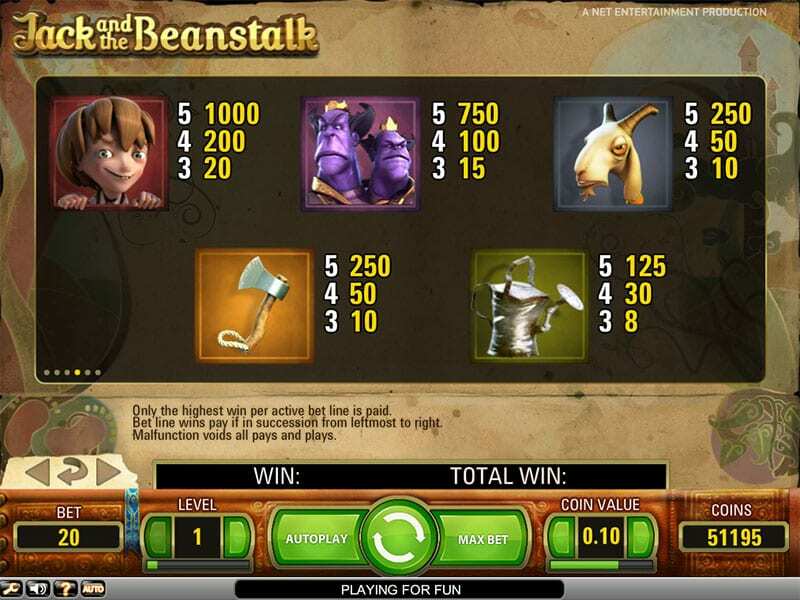 As you’ll have come accustomed to if you’ve played on other NetEnt games, Jack and the Beanstalk is packed full of great gameplay and interesting bonus features. The bonusing, in particular, will keep you wanting to play longer as it really does increase your chances of a big win. NetEnt was founded at the start of the online slots boom of the late 1990s and have really pioneered the industry ever since. Their slot games have been at the forefront of games development for the best part of 25 years and this is down to their no fear attitude to developing the features and bonus games within a game and also bringing new contemporary themed games to the market. It’s often the case that certain subject matter and game themes can begin to get stale. For example, we see the space exploration, Irish and Chinese themed games endlessly delivered without much thought. NetEnt’s latest software release; Finn and the Swirley Spin highlights the attitude of the brand and the boundaries they set. The graphics of this game are simply outstanding and a further development through technology that can be seen within Jack and the Beanstalk. It’s a 5 reel, 20 line slot, typical of what we’ve come to expect from NetEnt. They certainly know they’re on to a winning formula with the mechanics behind their games. So make sure to try the best 3D slots like this! The opening animation will really get you into the mood, it’s absolutely top notch. The graphics and design of the game itself aren’t too far behind either – it’s very welcoming on the eye and helps to draw you into the theme of the game. Overall, the look and feel of this slot are right up there with any slot you’ll find on the market today. For those of you who want to bet big (and hence increase your chances of winning super big! ), you can wager up to a humongous £100 per spin! At these sorts of levels, you really do need to understand your budget and to use it to gamble responsibly. Jack and the Beanstalk features quite a detailed yet approachable game board. Asides from the usual symbols and reels there’s also an extremely handy payline counter that’s visible at either side of the reels. This feature allows you to navigate each individual payline and learn how they intersect while also anticipating the best options and payline combinations for when the reels align. 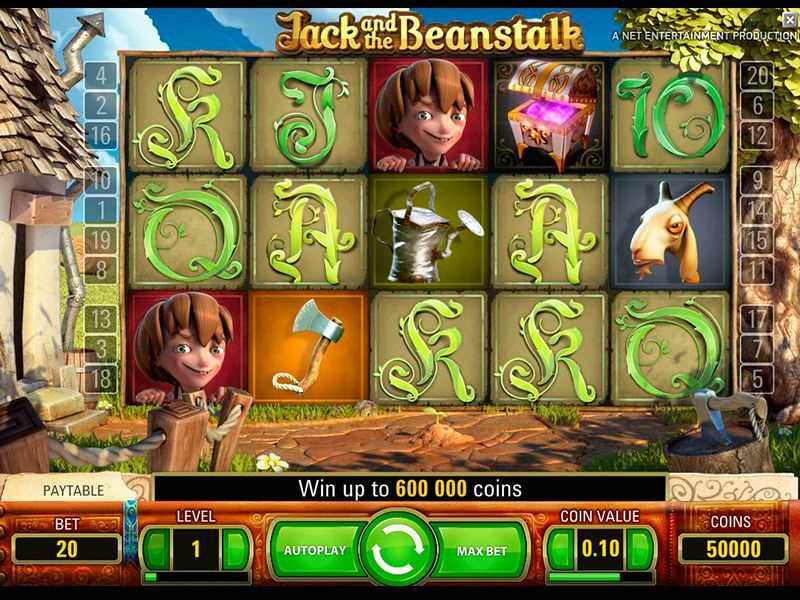 Additionally, the backdrop of the game is something to behold and certainly helps create a great fairy tale atmosphere and this coupled with the wonderful theme tune really embalms the player into the slot game. As mentioned the artwork throughout is immense. The backdrop shows you a cottage with some axes and logs and a beautiful blue sky. Even the standard symbols are pretty cool as they shape themselves into the beanstalk. The main symbols consist of watering cans, axes, and goats! And of course Jack himself! There is also a walking wild feature which will give you a free spin which can be re-triggered and hence will stack up freespins for you until there are no wilds left. This is a nice little feature! It will also activate another bonus game in which you can achieve win multiples. There aren’t many slots players out there who don’t love this game. The graphics and illustrations truly are superb but the great thing about it is that it doesn’t detract from the gameplay. It certainly is the right mix and is without a doubt the reason why this game is one of the most popular on the market. So go on, get playing and give Jack a hand up that beanstalk!